Connie Wheeler had discovered, again, almost without noticing it, that it was true what had always been said — in a way, that is, in the way that these things that had always been said were usually true. The conversation would meander through the mailman’s habitual responses (making Connie feel a restlessness she left unexplained to herself) until she would find a suggestion of her own: she complained. The second she complained of more often than the first. She had never been the cook, and her ingenuity was exhausted over a decade ago, when the cook had left their kitchen and had left her to lie down permanently. She’d left the kitchen with the house. It had been “too much to manage” for Connie. “I’m getting old,” she’d said then to her son over the phone, 2400 miles away. In the last few years she finally believed this, said it plainly, what had once been a joke between them. It made her a little sad, but at the end of the day it was nothing but true. The kind of truth, which was in her hands, her back, which couldn’t be denied. It was good to accept it, to make others acknowledge and accept it to. Once it was accepted, almost as if it weren’t true, it could fall into the background of things — after a time. The only living companion in her apartment was a cactus she’d bought thirty years ago, a stolid cluster of bladed ovals. It rested slightly right of center on her apartment’s screened porch. The cactus stirred only once a year, inching forth week by week in spring a vegetable scepter that would be jeweled for 24 hours with a tiny white bloom, tinted delicately at its tips with pink, in its funnel-shaped core with green. Connie was in the habit of leaving the porch door open for the fresh air. During the afternoon she would wander out onto it to soak in the warmth of the sun. Connie would delight in this growth, coming out to it each and every day and noting it and noting it as if she were a cactologist preparing a monograph. She would send a picture of the year’s flower to her son, just as she would send out the Thanksgiving, New Year’s, Christmas, Birthday, and Easter cards. She sent less of these cards each year, as fewer cards were returned. But her son always returned them, each and every one. He knew they didn’t mean much to her, she’d told him as much as she had sat at the dinner table writing them out, but his treating them as if they did meant as much as they could have — if they had meant so much. The suggestion would be dropped there. She didn’t complain to her son about her trouble with food. She suspected he would make too much of it. One by one her dishes had left her over the years. Her butter and lemon chicken became too rich for her stomach, causing a damming and then a sluice. Her meat sauce pasta, the long dash of red or white wine according to the meat, too acidic, likely to return like a worry, over and over, keeping her up at night. The simple things changed — maybe it was the result of her shift from shopping on a double income to shopping on social security and savings. This caused her to buy in bulks and retain things in her fridge possibly far longer than she should. And she stopped going to restaurants, except for the occasional stop at the cafe for herb tea and a croissant. She never could stomach coffee. The simple things turned against her, or something in her turned against them. Eggs took on a strange metallic tang, the florets of broccoli she broiled began to taste more and more like stubbed cigar’s odor, and vegetables in general had a tendency to be too firm or to become a flavorless paste on her stovetop. Salt lost its savor, or began to rise out of every dish as if it had been spilled into it. Toast with Welches, one minute Quaker oatmeal, jasmine rice, bananas, canned Campbell’s tomato and chicken soup diluted with water, plain non-fat yogurt — not the Greek kind that was everywhere now — with canned peaches, cheese sandwiches on the soft store brand of wheat bread, these became her staples. These basic dishes had basic tastes, sweetness, sourness and sweetness, savouriness, simple tastes and simple textures, had smoothness, crispness, and liquidity. They didn’t bother her, that was what she could say for them. She ate these things in small quantities, twice in the afternoon, sometimes in the morning or in the evening as well. It depended on if she had “got around” that day. “Going around” she went to the grocery store, the little stationery section in it, where she bought cards and embossed or ornamented paper on which she wrote short letters to her son, her friends, and her relatives, which were scattered across the state by retirement and the other events of life. She wrote similar letters to all of them, letters of sound but general advice (which was often irrelevant even being vague,) letters that re-stated her routine and the “California weather,” letters with the occasional, brief comment on the news, letters of affection. She’d tried to make more friends, but she couldn’t figure out where that was done, at her age. She couldn’t go sit at a bar until she knew everyone there, which had been what she’d done in her thirties and had moved to L.A. She couldn’t go back to work, just to do something: she couldn’t think of who’d take her, or for what. She contented herself with her letters, and the occasional phone call. But the letters were better. She could look forward to checking the mailbox every day. And there would be a page or two in the letter, sometimes with something juicy. People could say more when they wrote, more than they would say out-loud even with only themselves listening. She went to the post office where she mailed her letters and talked to the clerks about how the day and their work was. She went to the bank where she cashed her check and complimented the clerks about their chic young professional outfits. Once, a young and pretty female clerk had said excitedly, “This dress even has pockets,” and thrust her hands into them to demonstrate, turning them inside out, showing the shiny red lining. Sometimes she went to the cafe, when she felt, after the bank or the grocery store, she was flush. It was a modern place, all blonde wood and glass, like no kind of cafe Connie had known before. The baristas were all girls. 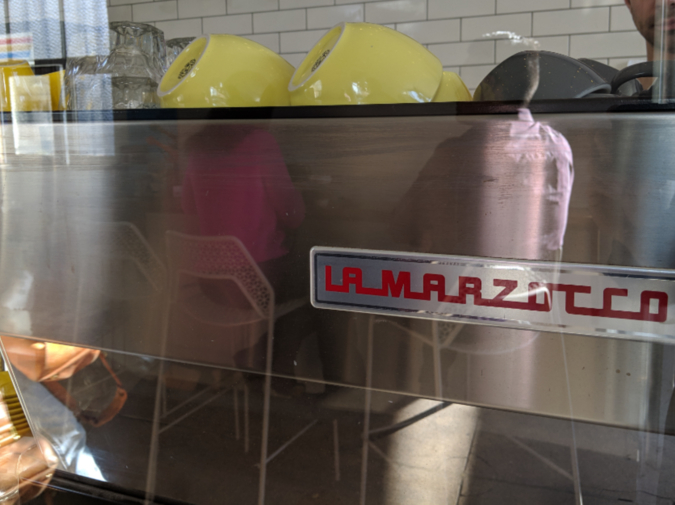 When they were not so busy, she sometimes chatted with the busy young baristas over the gleaming steel and hissing wand of the La Marzocco espresso machine. These had a peculiar charm to Connie. There was something for her in those young girls with their frowning, frantic expertise. She talked to them about the colleges they were going to, their dreams, about all the kinds of coffee there now seemed to be, about the places the coffee now came from and what that meant for their taste. “Miss Wheeler,” sometimes they would say, and she was touched. She usually said the same things over and over to the same people, and they usually gave the same replies, not really going much further, and none of them really seemed to mind. Connie didn’t mind. It was comforting. She’d included a 7/11 in this routine, earlier. There she had bought scratch-off lottery tickets, and, when the jackpot was high, a ticket for the Mega Millions. But once, when her son had been visiting, she had asked for him to stop there as he was driving her back home, and he’d asked her why, and then had given a look at the answer that made her feel that it wasn’t the cheap and shameless fun that she had felt it was. The events of the day were often better than her food, which was the reverse of what had been true in the rest of her life, when she had gone every day to an office. She had once looked forward to lunch all day long, and sometimes after lunch had looked forward to going out to dinner. Grilled, stuffed, marinaded, mashed, baked, pickled — all of the things Connie had loved to go out and eat, despairing over how they made her fat, trying to restrict herself down to chicken, to skip breakfast so she could eat more. Now there was only one thing that Connie Wheeler wanted to eat. In that large chain grocery store on Connie’s bus route — her eyesight was too bad for driving, she thought, and it made her nervous, and a car was expensive to maintain — there was a bakery section. It was lit with so much fluorescence as to be almost hallucinogenic in its visual clarity. This was true of the whole store, though the effect here was particular because of the small fluorescent tubing attached to the inside of the glass cases lining the wall containing the cakes and pies and cream filled pastries. Before these cases were two wooden tables loaded with certain standards — plastic clamshells of croissants, chocolate and plain and almond, danishes with a bright circle of lemon or blueberry or raspberry or the yellowish dull cheese, braided pull-apart pastries glistening with glaze and drizzle — and a constantly rotating stock of other pastries and breads. All of these were either defrosted out of boxes, or assembled from a handful of frozen components defrosted out of boxes, shipped from a warehouse fifty miles inland where they were assembled by machine and a smocked and hair-netted staff that spoke and played music in Spanish. To most, they were a middling pleasure at best, something they added to the cart because they might be nice with coffee at breakfast, and quick. Orange and yellow stickers were often on the plastic, “$5,” or “Manager’s Special!, “50% off. Nothing in the bakery cost more than twenty five dollars, and the majority of the high ticket items were large birthday cakes. Connie Wheeler’s delicacy was among this rotating stock. It was the “apple cinnamon loaf.” The loaf was like a loaf of bread, but with an oily crust, softer rather than crispy, and a little smaller, squatter. It was wrapped in a denser cellophane than normal bread. It crinkled at the slightest touch. In the hand it was heavier than any loaf of multigrain or sourdough. It had a smelled almost like stewed apples — something she had only had at her grandmother’s house. It tasted like apple cider — apple and something astringent — cinnamon, a strong cinnamon, warming, brown sugar, and sprinkled throughout the loaf, unadvertised, was some kind of dried fruit with a mild taste — raisins, probably — partially rehydrated by the thawing process. The texture was oily on the outside, and crumbly on the inside, almost dry in the core. Connie would always chew slowly, combining these two textures, enjoying how they combined and in combining re-asserted and re-balanced the component tastes. The apple cinnamon loaf was filling: she could eat two slices and be full until her next meal. But it didn’t upset Connie’s stomach, despite being so rich. Whenever she ate it, she regretted she enjoyed, now, so little else to eat. She bought a couple of loaves whenever it was on sale. It kept well, and could be frozen and unfrozen with little alteration. It had been two months since Connie had seen the bread on the tables, and three months since she had eaten it: she didn’t eat it continuously, buying a loaf whenever she went, afraid of wearing the pleasure out as she had once worn out Neapolitan ice-cream by eating it one scoop after dinner for three months. Her thrift demanded she only buy more when she was out. She was beginning to crave it. She pushed her cart, sparsely filled with her staples, past the bakery section to the deli counter. A man with a smock with closely clipped hair took an order of a half pound of black forest ham and a half pound of cheddar from a young man. The man in the smock took a ham from the case and placed it in the machine and pushed it back and forth, shaving off a slice. The man in the smock adjusted the machine and shaved a small pile onto a sheet of plastic. He took the plastic, weighed it, almost a half pound exactly, and wrapped it in paper. He repeated the process with cheese. Connie was pleased by this skill at weighing out the meat and the cheese. The young man took it away. The man in the smock came up to where she stood beyond the counter. There were mounds of olives and antipasto between them. He smiled his habitual smile, and though habitual, reflexive, it contained no hint of cynicism, or resentment towards Connie, “What can I help you with, Miss?” he said. Connie was pleased at being called miss. She smiled at him. “I was wondering about something in the bakery, if you could help me,” she said. “What is it?” There was a hint of something in this, and it made her nervous. “That I can’t, I’ll have to page our bakery clerk,” he said. “Are you in a hurry? It could take a couple,” the man in the smock said. Before she could answer he turned and went into the back and picked up a phone. She heard a name on the overhead. Once, twice, the name. Then he came back out. “I can come back,” she said hesitantly. She was done with her shopping. She took her cart and rattled off to the section with the magazines. She picked one up and browsed it without understanding. It was about people, celebrities she supposed, from after her time, with attitudes and concerns for people younger than her. Why did she care about what or who they wore? If they were going to have a baby? She supposed for some people this must be like the movies she watched all day on the internet television, which her son had set up for her a year ago over Christmas. But she watched comedies. Where was the appeal in these trivialities? She went back to the counter. The man with the smock was helping another customer. When he was done, the man pointed at her, winked, and made a clicking noise with his mouth. He paged the bakery clerk again. “On his way, miss,” the man in the smock said. “Can I interest you in a cold cut while you wait,” he raised his eyebrows. She got a pound of American. She ate the sample slice slowly. The bakery clerk, a tall thin man in a smock, with a preoccupied look, came up to the counter. “How can I help you, miss?” his voice was also bright. “I was hoping for some of the apple cinnamon loaf,” she said. She hesitated slightly again. She found she was starting to become irritated. “Well can you check about it,” she said. “O.K.” The bakery clerk walked around the deli counter into the back. After a few minutes, he came back. “What?” Connie Wheeler said, surprised that she had said it, and how angrily she had said it, how loudly. The man in the smock glanced over apprehensively. “I’m sorry miss,” the bakery clerk said. “Can I help you with anything else?” He could have checked in their freezer, but the freezer was cold, the only place he, being a Californian, had experienced sub-zero, and he had too much work to do, and this old woman was ugly and sharp and troubling him for a single loaf of bread. "Why was it discontinued,” she continued. He went away, and Connie checked out. She shuffled across the lot with her two canvas bags, waited on the bus, and boarded it. She was sad and tired. She went home. She put her groceries away, folded the bags and put them in the cupboard below the sink, everything had a place, and everything was in it. She pushed open the door went out onto the screened porch and looked at her cactus. There was a slight tumescence at the top of the topmost oval in the cluster. Soon the cactus would begin to extend a fuzzy tentacle towards the sun, to cluster all of its vegetable will into a bud, and — on and for one special day — open its scentless bloom. Joshua Hebburn lives in Los Angeles.